Heroes! is a City board-book released in January 2011. This is a description taken from Scholastic. Do not modify it. (visit this item's product page) Build your Lego® City library! 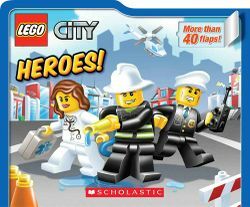 Everyone has an important job to do in LEGO® City! The police help keep people safe while the firefighters put out the fire. Lift the flaps to help the heroes save the day! This page was last edited on 9 January 2016, at 23:13.